PRESTON: Thank you all for coming. President Trump and his administration have given an impression of creating chaos and confusion in many areas of government, but on the issue of immigration, the Trump administration has been entirely focused, deliberate and straightforward. Guided in large part by policy director, Stephen Miller—domestic policy director, Stephen Miller, at the White House, and by Attorney General Jeff Sessions, the administration has sharply reoriented the goals and practice of the immigration system, seeking to reduce both illegal and legal immigration in ways the United States has not seen in a century. We have a superb panel to discuss this today. We have Alexander Aleinikoff. Alexander is director of the Zolberg Institute on Migration and Mobility and university professor at the New School for Social Research. He is the co-author of leading legal casebooks— big, thick, legal casebooks on immigration law and forced migration. Before coming to The New School, Professor Aleinikoff served as U.N. Deputy High Commissioner for Refugees from 2010 to 2015, and he was a professor at Georgetown University Law Center where he also served as dean and executive vice president of Georgetown University. 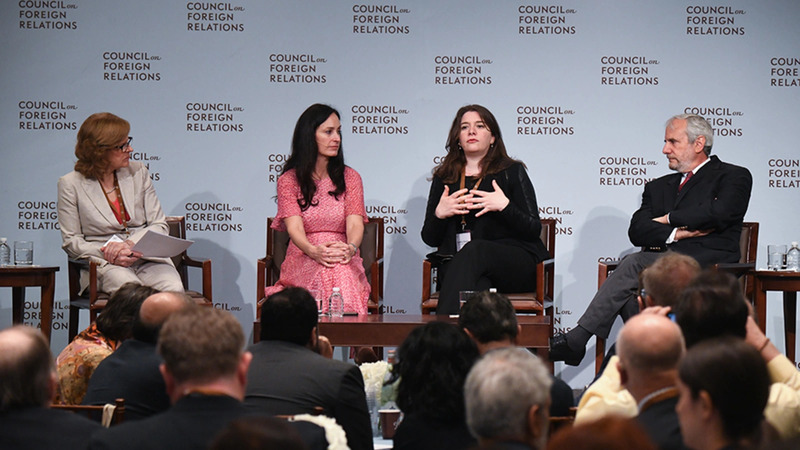 Shannon O’Neil is vice president and deputy director of Studies, and the Nelson and David Rockefeller senior fellow for Latin American Studies here at the Council on Foreign Relations. She is an expert on Latin America and U.S.-Mexico relations, global trade, corruption, democracy, and immigration. Camille Mackler is director of Immigration Legal Policy at the New York Immigration Coalition, the NYIC. In that role, she works on crafting NYIC policy, priorities relating to access to justice, and right to counsel for New York’s immigrant communities. She currently serves as chair of the Protecting Immigrant New Yorkers Task Force and the New York State Bar Association’s Committee on Immigration Representation. So we’ll get started right away with the conversation. First, to Alex, following his talk of the Muslim ban during his campaign, President Trump moved swiftly, but not always successfully—at least at first—to reduce refugee flows into the United States. Where does the refugee program stand now? ALEINIKOFF: Thanks, Julia, and thanks for having me here. So let’s back up for one second and remember where we are in the refugee situation around the world—65, 66 million displaced people by conflict, about a third of them are refugees outside their country of origin. This is the highest number we’ve seen since World War II, so we’re all aware of the huge need here, and at a time of huge need, the president carried through on his promise during the campaign to radically cut back on refugees. So recall that the so-called Muslim ban had two parts: one was a ban on visas—any kind of visa—for people coming from certain countries dominated by Muslims, and the second were executive orders dealing specifically with refugees. And what those orders did—I mean, Trump had claimed that we don’t know who these people are, we don’t know if there may be terrorists among them, so we have to tighten our security. So the first executive order stopped all Syrian refugees from coming into the country—5 million Syrian refugees in the world, that was prohibited—120-day suspension on refugee admissions while the system was looked at to make sure it was secure, and then a reduction in overall refugee admissions. Under Obama in his last fiscal year he had put the number at 110,000—the president sets that every year. Trump cut that to 50,000 without explanation, just cut that number. These went through various—the executive orders went through various versions as they went back to the courts and were put aside by the courts in various ways. Where we’ve ended up—without boring you with the long litigation—is almost where we started, but at a lower level; that is, the Trump administration said they tweaked a bit the security measures for refugees, but we knew all along that the screening of refugees was in fact the most serious screening that any immigrant gets coming into the country, through interviews, and checks, and data checks, and the like. So the—contrary to the president’s statement during the campaign that we don’t know who these people are, we actually do know who these people are and we—because of that, we have had no terrorist activity by admitted refugees in this country, and there wasn’t at the time. So that was a canard when it was put out. The main—so we’re back to the system now of letting people in. The problem is the administration for this fiscal year has cut the number to 45,000, but even at that number, they are slow-walking the process to the extent that, while we should be almost halfway through the year and we should have about 26,000—as I calculated—admissions already this year, we’ve had 12,000 refugee admissions. At a time the greatest number of refugees since World War II, the United States has admitted 12,000, well below Canada and certainly below large numbers that have moved elsewhere around the world. And the most recent data I have from the end of March—we’ve admitted 38 Syrian refugees to the United States of America. ALEINIKOFF: —I’m going on a bit here—is the United States has really lost its leadership in refugee protection around the world. We were people—the U.S. helped create the refugee regime after World War II by being active participants in the negotiation of the 1951 convention. We had, traditionally through our resettlement programs, admitted—more than half of all the world’s refugees were settled around the world. And the position the administration has basically taken is take care of them over there. So it’s much cheaper they say to help refugees in countries of origin or nearby, and we should basically shut down the American resettlement program, and that’s a mixture of security and money. And we can talk later about really the important role that the faith community plays in keeping alive the refugee system, but they’ve been the— you all have really been the blood of the system for many years in this country, and I know that a lot of you are hurting because the resettlement programs are important to a lot of the people in this room. So it’s not a very good situation on the refugee side and one that really needs to be changed. PRESTON: OK, well, hopefully in the— when we get to question and answers we can talk more about the impact of this policy on the resettlement program and what—and the way it has worked, I believe, to kind of deteriorate the potential for the resettlement program over time. OK. So Shannon, President Trump has consistently rebuked and heaped insults on Mexico over immigration policy. Most recently, when he was dealing with this caravan of migrants that came to the border, he at one moment praised Mexico, saying that Mexico had strong immigration laws, and practically in the next breath he denounced Mexico as—and claimed that what was happening to the caravan proved his original assertion in the campaign that there were a lot of Mexicans who were rapists and criminals. And so I’m wondering what—how has Mexico been responding to this barrage of contradictory or insulting rhetoric from the Trump administration? And has Mexico continued the cooperation that has existed for many years on this issue? O'NEIL: Sure. Well, thank you, Julia, and this is obviously an incredibly difficult subject there, and one is what is the actual underlying realities of migration from Mexico, and actually, increasingly from Central America through Mexico, and the other is then what does this rhetoric mean for the back and forth of what has been pretty significant cooperation between the two governments—the U.S. and Mexican government, particularly on Central American migrants. So just to throw out a little bit of a—of the actual reality below the migration from these various nations—so we often think of Mexican migration as this big flood coming into the United States, and that’s the way it was portrayed by Trump and by some others in terms of the need to secure the border and build the famous wall and the like. We have actually seen from Mexico declining immigration, particularly since the mid-2000s, and so, you know, since the mid-2000s, we’ve actually seen either net-zero or net-negative migration, so more people going back to Mexico than coming into the United States. We’ve seen the number of Mexicans in the United States—it has fallen by about a million people over this time period, so do Mexicans continue to come to the United States? Yes, they do. Do they come in the numbers that they did in the 1990s or early 2000s? Definitely not. And there’s lots of reasons for that. There’s demographic reasons, there’s economic reasons, and other reasons. There’s—a much harder border means it’s harder to go back and forth, so if people come here they often just stay here and they don’t go back and forth with the seasons and with work and the like. But overall we have seen a real change in underlying Mexican migration between the two countries to the point where it’s going somewhat in the reverse. What we have seen in recent years and particularly since the—2012, 2013 and on is we have seen a huge increase in Central American migrants, and most of those are coming through Mexico. And so for the last—for four of the last five years there were more Central American migrants coming into the United States than there were Mexican migrants coming into the United States. I’m not talking about the people going back, just the numbers coming over the border more Central Americans, particularly from Guatemala, from Honduras, and El Salvador—being the three countries where most of them are coming from. Now many of those people—unlike traditional Mexican migration, which was usually young men who were coming here to work, the Central American migrants that are coming, the majority are women and children who are coming, and they are fleeing horrible condition all around, horrible violence, gangs, also horrible economic conditions. Many Central American nations have been hit by an ongoing drought over the last decade, and so farming and basic subsistence that people had relied on for decades has just disappeared. So we have seen this wave coming through, and the United States—I’m sure all of you will remember 2014. There were many Central American migrants, upwards of 240,000 that ended up at our border. It was all over the TV, it was—all the politicians were hand-wringing all about it, and it was this huge crisis for our system. In the wake of that, the United States and Mexico started working very closely on those flows, and Mexico really—with U.S. help, but also on its own—stopping many of those people. So in the last few years Mexico has stopped anywhere between 100,000 and 150,000 Central Americans from crossing through Mexico to the U.S. border. They’ve either deported them back from the southern states or from their own border, or they also have absorbed tens of thousands of Central Americans into their own society and economies and the like with some bumpy rides along the way. But you have seen more Central Americans settling actually in Mexico. And this is—you know, Trump came out recently, as Julia just said, and said, you know, they’re not doing anything, they’re not stopping anything, there’s a caravan of a thousand-plus people coming, and look at that. You know, Mexico was stopping 150,000 people at the same time, and working very closely, and spending a lot money and effort when they have a lot of challenges on their plate to work with the United States to stop these Central Americans from coming in. So what does that mean? You know, when your neighbor and someone that you think you are working closely with disregards you in that way, it can’t be an easy thing. This particular government in Mexico has let a lot of these insults roll off its back. It has looked for ways to find cooperation, let the tweets and some of the rhetoric go, and really focus on the policy. But this government is coming to an end. We—or Mexico is going to elect a new president in July, and that new president will take office on December 1st. And so as we look at the candidates out there, particularly the leading candidate, Andrés Manuel López Obrador, who comes from the left and has his own party, he has already made statements that he will be less cooperative on some of these issues with the United States. He comes—his world view is much more based on—there’s some nationalism there, there is a much more inward-looking, economically focused model. He comes from a sort of 1970s, I would say, perspective of the world and of how Mexico should grow. And that perspective I don’t think includes working hand-in-hand and spending lots of resources on stopping Central American migrants from coming up to the U.S. border. PRESTON: OK. Just one more question about that. How are Mexicans seeing the whole dialogue about the wall? Have they—has this like—have they become numb to this, or what is the wall—how is the wall figuring in the Mexican mentality right now? PRESTON: (Laughs.) A priority—on a priority list of insults? O'NEIL: And I think the cooler heads see that it may or not ever get built, right? We already have over 700 miles of wall or, you know, some sort of barrier along the border, and so I think there are sort of the cooler heads—will this really ever develop? But returning to that issue, returning to sort of the ugliness, putting migrants in general in a very ugly light, putting all this—none of that does well for the back and forth in the relationship. And I would say up until now Mexico’s government has not hit back. When these things have come out they’ve let the tweets slide. They’ve cancelled visits or things like that, but they haven’t publicly come out and thrown it back at them. But that doesn’t mean that will always be the case, particularly when you have a new administration coming who wants to prove their bona fides. PRESTON: All right. I’ll come back to you about another country that has—but let’s go to Camille. So Camille, a report from the front—you are on the battle lines here in New York City, so what is the—what does it feel like? What are the immigrant communities experiencing here in New York? Is this a sanctuary city? Yeah, I mean, obviously the last year and a half have been tough. I do want to preface this by saying that a lot of what we’re seeing now is an exacerbation of the systematic failures of our immigration system, right? These problems that we are addressing today—a lot of it—we were dealing with it two years ago, three years ago. Julia, you reported on this a lot. This is—a lot of these issues are not new, they’re just being made worse. They’re just being—you know, I mean, the 2014 refugee—you know, unaccompanied children’s crisis that you referenced, Shannon, that happened under a different administration, and there were many problems around that, right? A lot of—how the response to that, a lot of the rise in family detention and all of that. But to bring it back a little bit more locally, I mean, it has been terrifying. It has been devastating, the impact of these policies of the sort of reckless enforcement that we keep seeing of just literally snatching people maybe not off the streets, but—well, sometimes off the streets—or taking them and then they disappear for days because they are being put in a detention center, no one knows where they are, you know, there’s no number to call. The numbers you have don’t pick up or you—they get picked up by somebody who feels very empowered to be rude, to be dismissive. And then you—it turns out your family member is in Florida or is in Texas. It has been absolutely devastating. And even if that’s not happening to every single family, the possibility of it happening to every single family, I think, is enough to be very—to be terrified. But this—and this isn’t just to our undocumented population, I mean, as we’re seeing people cycle through the adjudications process and go—you know, applying for benefits, the questions that they are being asked, the—you know, the so-called extreme vetting—that’s actually really happening at every single level. And so the response of New York City—and let’s focus on New York City and not New York State, which are really two very different animals, but is there such a thing as a sanctuary city—you know, we explored that a lot, especially at the beginning, especially in those sort of two and a half months between the election and the inauguration when we sort of started—you know, and the term sanctuary city was really coined within that year preceding the election. The term sanctuary obviously, right, as we know it, usually applies to houses of worship, to places of faith where individuals may go to seek protection, and on a sort of legal—from the legal perspective, Immigration and Customs Enforcement—ICE—has a sensitive locations policy saying they won’t conduct enforcement in certain areas, and houses of worship are one of those areas. So there was this sort of very logical thought of can individuals go into a church, barricade the doors, and protect themselves, and some have. And so far it’s working. PRESTON: So far it is working? MACKLER: Yes. So far the few who have gone into the churches remain in the churches. Now they remain—it has been a year almost, I think, for some of them, but it—ICE has not—I think they realize the PR nightmare, frankly—(laughs)—that it would be, and they haven’t gone there. But we’re really talking about less than a dozen, at least in New York City. The concept of sanctuaries has been expanded to schools, campuses—university campuses looking to become sanctuary campuses, looking to see what kind of policies they can adopt to prevent ICE from coming on because that’s really what we’re talking about when we’re talking about sanctuaries—preventing ICE from appearing and arresting individuals. Hospitals and other health care centers have looked at the term. The city in itself—I mean, if we are thinking of sanctuary as a fortress or as a city that you put a bubble over and ICE can’t penetrate, that’s not what—that’s not possible. That’s not what’s happening. If we talk about sanctuary—if we redefine or view sanctuary—sanctuary cities as a place that adopt, in my view, common sense policies to, you know, make sure that immigrants and those who support them continue to have faith in public institutions, and that they, you know, continue to have faith in law enforcement, therefore don’t believe that law enforcement is just one step—you know, local law enforcement is one step removed from immigration enforcement. New York City has adopted policies, New York City has been at the forefront of those kinds of—of that sort of thought, you know, adopting restrictions on how law enforcement can interact with federal enforcement. Both New York City and State—combined, New York City and State invested $65 million in lawyers for immigrants last year, which is probably the largest national investment—or at least one of the largest national investments, and I’m a lawyer so I’m a little biased, but I don’t anything protects your freedom—(laughs)—and your rights better than having a lawyer and—which is not guaranteed in immigration. You are not guaranteed a right to an attorney at any point, even when you are facing deportation, even when you are being detained, even when you are being stopped by immigration enforcement for criminal enforcement. And so the questions that remain—and I know we’re going to talk about this in a little bit—is for example when we’ve seen the Trump—well, the current administration, the White House administration, you know, use gang allegations. PRESTON: —in the coalition, right? PRESTON: Talk to us—talk a little bit about that. MACKLER: Do you want me to do that right now? Sure. MACKLER: So we—we’re about to put out a report I think next week—fingers crossed. It’s going to come out—we did a field survey. We teamed up with the City University of New York’s law school, and we did a field survey of practitioners on Long Island, New York City, and in the Hudson Valley who work with individuals, with communities, or lawyers who work with clients who have been—who have been accused of membership in not just any gang, but MS-13 specifically. The two-second history of MS-13 is it started in Los Angeles with Salvadoran immigrants—you know, migrants who were deported back to El Salvador. It grew in size, and now they are coming back here—or they are creating cliques here. They are not just coming from El Salvador. And so MS-13 has sort of become this bête noire of Jeff Sessions and Donald Trump, right, that he had the agents at the State of the Union, and the victims. And meanwhile, if you look at the national sweeps—gang sweeps that, you know, the FBI, and DEA, and ATF, and all them do, MS-13 arrests are maybe 7 percent of those arrests. The gang itself is actually very small, and if you look at its East Coast presence, it’s even smaller, but they have—so our survey was to see how are they actually using these allegations. I’m sure you’ve all read—there’s been some great pieces in the New Yorker, Vox, the New York Times, other places that have really highlighted how federal immigration authorities are going into schools, and they are arresting mainly young Latin American males, some women, too—mainly teenage girls, really, but using Long Island as the ground zero, you know. I think President Trump referred to them as the once idyllic suburbs that are now blood-stained killing fields. For MS-13, that was Hempstead and Garden City on Long Island Brentwood. So really sort of using this, and what we’ve seen is that they are taking these children, sending them to California, putting them into detention—you know, into detention centers in California, other places, and then, using—and whether they are detained or not, using these allegations of gang affiliation or gang membership to justify denying them benefits, so they’re denying asylum, they’re denying special immigrant juvenile status, which is a way for some immigrant youth to obtain green cards in the United States. In some instances they are revoking the previously approved applications and then they are putting them into deportation proceedings and using the gang allegation and the gang membership to deport—to, you know, argue that these individuals should be deported. Now gang membership is not a crime in New York, it’s not a crime under federal law, and it is not a ground for deportation in the United States, so this is all done in their discretion. And what’s worse is that it’s all done on unsubstantiated allegations. So they say, this person—this person is a gang member; therefore, we detain them, and now we have to deport them because they are a gang member. And you say, well, why are you labeling them a gang member in the first place? Because we created a memo that says that they are a gang member, you know? And if you pull a little more, they’re like, well, they doodle, they wear color, they supported a team—I mean, look, why anyone would support the Chicago Bulls I don’t know; I’m a Knicks fan. (Laughter.) But, you know, nonetheless I don’t think you should be deported for it. And that’s ? what we’re seeing. PRESTON: Yeah. All right. Yeah, we can take more questions on that. PRESTON: So Shannon, let’s go back to you for a couple of minutes to talk about Venezuela because this is a new refugee flow, a new migration flow. So what’s going on with that? O'NEIL: Sure. I mean, when you look at Mexico, they were not refugees—the Mexicans—most who came here. Central America—we can argue many are refugees, but they’re not treated as such. Venezuela, I think, as we talk about the number of, you know, 60, 70 million refugees going around the world, you know, being removed from their homes either internally or externally, Venezuela is the new addition to this and I think is probably the under-covered story right now. For those of you—I’m sure if you’ve been reading the news that you know there is an economic collapse that is happening over the last five years, and we finish—by the time we finish this year it is estimated that the economy there will have shrunk between 45 and 50 percent, so the whole economy—half of the economy has disappeared over the last five years which is—it’s just almost impossible to imagine what that means. There is very little access to food, there’s almost no access to medicine, there is increasing violence in the streets, and this a country that is being run by—increasingly—a military government but also one that is engaged in extensive criminal enterprises. And so in the wake of all this, in the wake of ending any fair elections, of repressing and putting in jail many opposition figures and the like, we are starting to see an exodus—well, we have been seeing an exodus of people over the last several years, and during the first—so almost 20 years of this administration we saw somewhere between, you know, 3 and 4 million people leave. We are now seeing the numbers coming to the border being 5,000, 10,000 a day, so we’re talking in the—2018 probably somewhere—if things continue, which I don’t unfortunately see a big change happening—probably somewhere between 1.6 and 1.8 million people leaving Venezuela just in 2018. And those numbers could increase. So you have 4 million outside. You might have 6 million outside by the end of the year or somewhere close to that, starting in 2019. These people, they actually—Venezuelans have become the biggest asylum seekers here in the United States, so they’ve risen in the ranks in terms of that, but they really are—it is very hard for them to get asylum here, and they really are pouring into the countries around them, so Colombia has over 600,000 people there, and there are over 5,000 every day coming across the Colombian border and staying. Peru has a hundred thousand people, Brazil has somewhere between 50,000 and 100,000 people. Argentina—they are flooding all of these countries, and some with limited capacity to absorb these people. And so I think this is a huge crisis that’s hitting the Western Hemisphere, and unfortunately our country is not going to be taking the lead on it. But it will come—they will be coming here to the United States as well, even though it’s further away. PRESTON: So we have a few minutes left in our conversational part of this, and I was wondering if each one of you might address the question of the role of faith-based communities in the areas that you’ve talked about. Are faith-based communities active? Are they effective? How would—how do you see that? ALEINIKOFF: Yeah, well, faith-based communities have been crucial in the refugee resettlement system forever. I think I see Mark Hatfield in the very back of the audience. He is CEO of HIAS, was—has been one of the longest standing and largest resettlement agencies, and there may be members of other of the faith-based organizations here who have worked on this, so they have been crucial on resettlement. I think—and also just generally on current immigration issues. I was thinking about this. I think there are sort of three things faith-based organizations could be—could be doing. The first is on the narrative, and here it’s both facts and values, so the kinds of things Shannon was saying which are well-known within the immigration communities—more Mexicans have left than have come in four or five years, people aren’t pouring across—we need to keep saying those facts over and over and over and over again because it’s just not getting out. The Trump message really has dominated. And on the values side, all these—you know, the religions of the United States are on the right side on the values side on migration. I don’t need to say more about that. The second is on just resistance—the kinds of—sanctuary work is really important. There may only be 12 people in New York, but these are public statements that are really powerful. When you help people who have been picked up or sought with deportation, they make very strong statements because they are very compelling cases that Americans respond to. These—why would you separate families, remove someone who has been a pillar of the community, et cetera, et cetera. So that kind of direct action on the ground can be important. And the third is legislative. A lot of you are involved in broader coalitions, and we need to keep pushing for comprehensive immigration reform and legalization because most of these problems would go away if we had a decent legalization program that would—that would legalize most of the undocumented community who, as Shannon pointed out, has been locked into the country. The average length of stay for an undocumented immigrant in the United States is now more than ten years because they come and they don’t—used to be this circular kind of migration. People come and stay, and it’s really time to legalize the statuses. We’re not going to get it immediately, but we’ve really got to keep that going, and that will remove an awful lot of the problems we’re dealing with here, so three major ways I think people can help. MACKLER: I think—I agree with everything Alex just said, especially the sort of—on the external side faith being that strength for individuals, sending that strong message, but also being that sort of place of strength for individuals who are looking to resist these policies on the inside. There’s a group here in New York City called the New Sanctuary Coalition that’s a network of faith-based organizations, and they have created a very—just as one example of how faith can work here in this instance is they’ve created an accompaniment program, so a lot of times individuals who have been on basically the immigration equivalent of probation and having regular check-ins with ICE, they—and they’ve been doing this for years but have really ramped up these efforts in the last year because now these individuals go in for their check-ins, and whereas they may used to be given another day to come back—you know, six months, a year from now—now they are being taken into custody. And so the program accompanies them. These faith leaders themselves or with their volunteers accompany the individuals into the check-in, and at the moment of detention, if that happens—which is more and more frequent, which is a real moment of crisis for the individual and their family—they’ve been able to sort of deescalate that. They pray, they explain to the individual what is happening because a lot of times they are scared, they are confused. They can take their belongings, they go back out into the waiting room, they walk the family through it. That’s been very, very powerful, and I’ve been in meetings with these faith leaders and ICE leadership, and ICE leadership has been, you know—they’ve become pretty—sadly, they’ve become some pretty antagonistic meetings, especially when you have more people like me, like advocates and lawyers in the room where we’re butting heads a lot more. But the faith leaders that have been present have been able to deescalate and sort of, in any way possible, remind ICE to bring some compassion and dignity back into this process. And at one point they were kicked out, and they were able to convince ICE to let them back in because they said, you know, we’re taking this moment of crisis and deescalating it, and it works better for everyone—even though we don’t agree with what you are doing. And to me that’s been—that’s been very powerful, and on the individual level, just giving that measure of comfort to somebody who is going through that—when I feel very powerless as an attorney to do it is I can’t—you know, I can’t estimate the meaning of it. It’s beyond words. O'NEIL: Well, let me speak a little bit about the faith organizations in the region or in Latin America and their role, and they are playing, I think, an incredible role in many of these issues. You see in Mexico, particularly for the Central American migrants that are coming through, the migrant shelters and sort of basic support that you get especially for these families coming through. Most of them are being run by faith-based organizations, by the Catholic Church, or by other groups. And so that really is the only, you know, space that a lot of people are given as they are making an incredibly arduous and incredibly difficult journey and dangerous journey. So I think there’s a—there’s a role there for those individuals that are coming through. And you saw it with the caravan that got so much press that there were faith-based organizations, that they stopped along the way, and that were also with them for parts of the process. And then I would just say a word about Venezuela, and as I look at Venezuela, almost every independent institution has been destroyed, or co-opted, or repressed, so you look at political parties, you look at the judiciary, you look at different branches of government. You look at the media, you’ve got other civil society organizations—almost everything has been destroyed. And the only one that really is left standing at this point are faith-based organizations, and particularly the Catholic Church and its charities—Caritas and others. And those are the only really independently operating institutions in that country today that are—especially Caritas is delivering—for some Venezuelans—food and medicine; not what’s needed, but at least there is some access there to some individuals, letting people there basically survive. And as I look to the future of Venezuela, if we get to a point where we see some sort of political change at some point, I do think it is the faith-based community that are the only ones that really can work to rebuild with those that are coming back. I think it will be an incredibly important organization and set of institutions to rebuild Venezuela at some point. PRESTON: So I’m just going to close out this part of the conversation, drawing your attention to a policy that the Trump administration announced early this week on the assumption that all faith-based people have common principles in terms of the idea of welcoming the stranger and also the preservation of families and trying to keep families together. And that is that the attorney general has announced a policy in which virtually anyone who comes to the border and who doesn’t have proper documentation will be subject to criminal federal prosecution. So this is no long in immigration court; this is—he is going to be charging the criminal misdemeanor of entry without inspection. And part of the reason that they want to do this, the attorney general said, is so that they can take the parent into custody. We have to remember that most of the people that are coming to the border now and asking for protection in the United States are women and children. Sometimes the children are unaccompanied, but many times the women are coming with their children. So under this practice, the parent would be taken into custody and that, according to the administration, would give the border authorities power to declare the child unaccompanied, and so the parent would be separated from the child at the border, and the child would be put into an unaccompanied shelter system, which the administration is very rapidly turning into a detention system for children—so a system that was set up and, under statute, is supposed to be in favor of the best interests of the child is now being transformed into a detention system for minors and children. And the administration is pursuing very actively, and explicitly pursing a policy of separating young children from their parents at the border. So I just wanted to bring that to your attention. And I was remiss about a fundamental responsibility of mine as a moderator, which is I did not inform you at the beginning of this session that it is entirely on the record. We’re going to have questions now. I’m going to ask anyone who wants to ask a question to stand up and identify themselves by name and organization and then we’d be happy to take questions. ROBERTSON: Chuck Robertson, the Episcopal Church. This is primarily for Alex, but indeed for any who wish to answer. The Episcopal Church has Episcopal migration ministries, for over 80 years one of the refugee resettlement agencies, one of the nine. A lot of people actually out there—it’s fascinating to me how many don’t realize that everyone who comes in as a refugee has—comes in through the nine refugee resettlement agencies, six of which are faith based. Right now, as you were mentioning about the refugee crisis, for our agencies they are in an existential moment themselves as the grants are drying up, as the numbers are drying up from our administration. We have learned through this now to start working on emergency contingency plans to have a skeleton of a system in case the bottom completely falls and then we have to one day, hopefully, be able to rebuild. But I wonder what lessons are we learning now so that we don’t simply say, well, let’s just wait for the next administration, and then, you know, there may be more sanity on this issue. Are there other lessons we can learn to be able to think through this? Or is that—are we literally that vulnerable, period, as we go forward? ALEINIKOFF: Boy, I don’t have a great answer on that. I think you are vulnerable. We saw this actually with the dip after September 11th, as well, when the refugee missions plummeted and a lot of the organizations—resettling organizations were in very hard times and laid off staff. You really are dependent on the refugee admissions, which is solely a presidential decision. So, I mean, this is tough. One thing you could think about it whether or not you can—there’s not money in this unless you raise it independently, but how much can you shift to helping asylum seekers in the country. There are huge needs there, so that’s—I don’t—I don’t have a great answer for you. I think this really is—has to be a political fight about restoring our refugee programs, which, you know, have taken a hit. SINGH: Hi. Satpal Singh from Sikh Council for Interfaith Relations and the University at Buffalo. I want to come back to a point that Alex made about changing the narrative through faith-based communities. And I think that’s probably one of the most profound things faith-based communities can do in terms of not only short-term impact, but also long-term impact, and impact—and I don’t think that’s being done enough. I know of many organizations individually and many faith communities that are doing it. Is there anything that can be done at a pan-faith-communities level to catalyze it much further? I think that’s one of the most important things. Otherwise, MS-13 individual cases take up much more loudness than anything else. Thanks a lot. MACKLER: When we were getting for and then responding to the Muslim and refugee ban last—over a year ago in January, what was the most powerful to us, I think, in sort of communities was the showing of support from all faiths. We did—we organized the Friday that the ban—the first ban ended up coming up. We organized a jumu’ah in front of the courts and the immigration building. The jumu’ah is the Friday Muslim prayer, and it was—you know, we had—so we had Muslim faith leaders leading this prayer, but it was encircled by other—by allies. Those of us who weren’t Muslim sort of stood around in a protective wall, and we had a rabbi there, we had—I don’t remember all the different faiths, but we had all these other faiths who spoke. And we, again, on the one-year anniversary, we had another moment in front of Ai Weiwei’s sculpture around it. I agree with you. I think that that showing of interfaith solidarity in moments like this is crucial, and I can’t speak for—I should be able to, but I can’t on this particular issue because of policy impacts, but I can tell you that in our communities it is magnified. KNOTTS: Bruce Knotts, Unitarian Universalist U.N. office. I want to draw your attention to the New York Declaration of the United Nations and also the upcoming summit in September at the United Nations on migration. Current refugee law is founded on a World War II basis of a well-founded fear of persecution because of your religion, ethnicity, political views, and people are forced to migrate for other reasons: war, climate change, economic collapse, and crime. And I think it’s time that we revise our definitions of refugees to include these other categories because they have to leave. There’s no choice. You’ve got to get out of your country if it’s under water, if it’s inundated by crime, if there’s economic collapse like in Venezuela. What are your comments about changing refugee law? ALEINIKOFF: Well, I’ll take that one. ALEINIKOFF: Mexico is one of the co-facilitators on the global compact on migration. There’s also a global compact on refugees. ALEINIKOFF: The—so this is really—this is a really complicated question. I’ll just try to do just the highlights on this. You won’t get an agreement to expand the definition of refugee in the 1951 convention. There are other groups that are not included. Actually, UNHCR treats people fleeing civil war as included, so the groups really left out are probably climate—people fleeing climate and severe economic deprivation, even though they may sometimes fit within the persecuted category. There was some hint that these broader groups—it wouldn’t amend the definition, but there might be language in the global compact on refugees which will be negotiated this year that would expand international protection to this group. That seems now not to be on the cards for the global compact on refugees. It may work its way into the global compact on migration that Mexico is co-facilitating with the Swiss. There does need to be broader international protection for people who flee across borders and it’s not safe to go back. I think people recognize that, and I think this is mainly being done now at the regional level, so Africa has a broader definition, and the Latin American countries have a broader definition that takes into account people who flee other kinds of disorder, natural disasters and the like. So my guess is it’s going to have to bubble up through the regions and through practice on the ground, and in fact, the world does pretty well when there is a tsunami or a natural disaster—there is aid that is flown in. But focusing in on changing the definition of refugee in the convention I don’t think is the right way to go. I think you will—there are other ways to approach this. MACKLER: Can I say something, too? There is a mechanism in theory under American law to protect those individuals, which is called temporary protective status, right, which would address sort of that issue that you are pointing out that the five protected grounds don’t address these individuals, and it also would address the fact that, for asylum, you need to make a showing of individualized persecution. In a place like Venezuela, everyone would fit, right? And unfortunately, this administration has really gone after temporary protective status, so I don’t it as a viable option. But that mechanism does exist under American law, and lawyers more broadly have been, you know, filing suits; for example, going back to the gangs, like gang-based—you know, gang-based persecution isn’t technically a protected ground, but there is litigation working towards trying to expand the definition—so litigation at least in the U.S.
PRESTON: Back in the back. Yes. And then I’ll come in here. SHARON HARPER: Hello. My name is Lisa Sharon Harper, and I have a quick question. Given who our president is, his white nationalist affiliations, his sentiment toward white nationalism, the place we are in our world with the reality that we have more refugees in the world than since World War II, that we have more hardline policies happening across the world—I was just in Australia dealing with their Manus situation—I wasn’t dealing with it—but realizing more and more of what’s happening there and the similarities between them. I’m wondering if there is a way to shift the narrative so that we go to a higher level of the narrative, maybe even to see a white nationalist agenda happening globally, and wondering if that might be helpful, or even if you see that to be happening, if you see that to be true. ALEINIKOFF: I think it’s hard not to see in a lot of the Trump policies concerns about immigrants of color, and I think that should be called out. But I don’t think a negative narrative is the narrative we need. I mean, I—I don’t know what the new narrative is. I mean, it will really be an interesting thing. It’s not Emma Lazarus any more. You know, we need to think about some other way to—and it’s not identity politics, and it’s not—to me it’s not just America the melting pot. You know, we need a 21st century narrative. I don’t know what—I mean, I would like to think hard about what that might be. I don’t think it’s—I think you need to call out racism when you see it, but I don’t think that’s a narrative either. But I think you have a strong point about how these harsh policies really tend to fall on immigrants of color. PRESTON: Did anyone else want to respond to that? O'NEIL: Yes, I think—I agree that that is what’s happening here in our country, but I do think when you see a wave of migrants coming in—or refugees or whatever they are—that it doesn’t necessarily have to do with that and, you know, you see that, for instance, in Colombia. You’ve seen a huge number of Venezuelans pour into Colombia or into Brazil, and there the—you know, the ethnicity is not all that different. The nationality is different but not the ethnicity necessarily. But it is playing into their politics, and while initially I think the Colombians were quite welcoming and warm, you are starting to see they are in the middle of presidential and regional elections, and you are starting to see the Venezuelan challenge increasingly be there, and candidates positioning themselves in more xenophobic ways. And so I think it has a lot more to do with worries about disruption, worries about economic gains, worries about sort of what does it mean for my family when these other people come in. Then it has to do—in that particular case then it has to do with sort of the color of the people’s skin coming in. But I don’t doubt that that isn’t a—isn’t part of the issue here in the United States. PRESTON: Ah, yes, there. And then I’ll come over here. MOLINE: Hi, I’m Jack Moline from Interfaith Alliance, and last week we were horrified to hear the president suggest that faith was a stronger authority in this country than the Constitution when he talked at the National Day of Prayer. And yet here we are talking about the dominance of our faith commitments over what’s the current legal approach in the United States. Help me with the language that makes a distinction between what the president is suggesting and what we think is right. PRESTON: Alex? All those law textbooks? ALEINIKOFF: I’m just imagining the president at the National Prayer Breakfast. I just don’t get it. (Laughter.) This is not a man that’s shown any interest in religion his entire life. Why he would be invited or why his words would be taken seriously—and I’m actually very disappointed as a political matter among the—some fundamentalist groups that have—continue their support for a man who seems to be fundamentally in contradiction to almost every value that they hold dear. So let’s—I can’t even—so I don’t want to put it in terms of Trump—the question—I don’t think religious values trump the Constitution here. I’m not exactly sure what the question is. Religious values, as any values—for atheists as well, for humanitarians—talk about the importance of family, talk about fair and just principles, fair treatment that lawyers are pushing for and the like. Those are all consistent with our constitutional values. I don’t anyone is asserting a value that’s—I don’t think people are talking about established religion in some way, about separating church and state unless you are hearing it somewhere. I would be interested in hearing more what you are saying. MOLINE: First of all, whether or not the president belongs at a National Day of Prayer is a question I don’t think we don’t have to debate in terms of his personal demonstration of faith. But he did say very clearly that faith has greater authority than the law, and speaking to his base when he was standing there, to the primarily—the representatives primarily of the religious right. We are calling on faith communities to resist in ways that are at least technically illegal, and we’re defending it on the basis that our faith has more authority in our lives and in the lives of the people we’re protecting than the current law of the land. Yeah, so to me—I mean, look, there is a tradition of civil disobedience in this country, and it—civil disobedience requires public statements of what one is doing and why and willingness to take the consequences for it. And whether it’s Martin Luther King, or sanctuary movements, or other kinds of protesters on other issues, I think you respect that protest and then people bear the consequences under the law. I’m not claiming an exemption from the law for actions. I think you have—that’s—the tradition of civil disobedience is you go to jail under the law because of what you believe in, so that’s I think how I would bring them together. PRESTON: I might step out of my role as the moderator for a minute to respond to that also, which is I think that many of the values that I understand the faith-based community embraces are embedded in American law, and it’s not—there’s a wide range of activity here that would not put any person of faith in conflict with the law. For example, the asylum system—the asylum system, there’s a—there’s a crushing need for assistance of all types for people who are going through the asylum system at this point, and there is a conflict—there is a political dispute, a difference going on at the border over who should be entitled to have access to the asylum system. And the Trump administration has taken the position that basically all the people who are coming from Central America are illegal migrants. They are not asylum seekers. And so the administration is moving to just make the avenues of asylum unavailable to those migrants. And I think there is another argument that can be made and is being made by many people—people who live in the border areas, people who are familiar with the system, the immigration courts—that there are people, there are migrants in that flow who should be entitled to access the system. So I think there is a wide avenue here of activity for people that doesn’t create the direct conflict that you are describing there. Sorry. OK, back to being the moderator. Yes, let’s see, who have I—here, I’m going here, and then I’ll go back over there. Yeah, sorry. MCGRAW: Barbara McGraw, Center for Engaged Religious Pluralism at St. Mary’s College of California. After 9/11, I understand there was a vast expansion of the immigration detention centers, and that that continued under the Obama administration. And I was wondering if you could speak to what is happening now with the change in policies around the detention centers. Are those still growing? It’s another whole mass incarceration that’s kind of under the radar, not spoken about much. MACKLER: Yeah, I—you know, without getting too deeply into the debate over the privatization of the jail industry and jail complex, the quick answer is yes. It has continued to grow, they have just signed contracts to open new facilities. They have—the administration has restarted the practice that used to be that they would at least make—at least in New York—I can’t speak for other parts of the country, but in New York they would make an attempt to keep the individual sort of in the general area of their family and lawyers and such. They don’t do that anymore. It’s pretty common to have somebody be shipped off, you know, wherever. I think, as Julia sort of highlighted earlier, really—where this is really devastatingly played out is the juveniles, that ORR is transforming into a more jail-like setting, and they are sending these youth to these secure facilities, which are just jails. Yeah, I mean, they view detention as a tool, right? They have a—they view it as a mandate to detain as many people as they can, and it’s just increasing. And not only is it increasing, but they are pushing back on the oversight of it. So they are being less responsive to requests for information around, you know, the standards and how they have detention standards, are they upholding them. There’s a lot of fuzziness around how the contracts are handled, and so they are building new facilities, they are contracting with new facilities. Here in New York we have a really large center up in Batavia, which is about an hour southeast of Buffalo. They have now started detaining women there. And also—again to Julia’s point—what they are doing is they are transferring people into marshal’s custody whenever they can make a criminal case against the individual, so this new policy announcement that we saw, the—you know, of taking the parents at the border, that’s going to play into that, but if they ever—if they encounter somebody who reentered after a deportation order, it used to be that they wouldn’t necessarily criminally prosecute them although even—they can, but under a memo signed about a year ago by Jeff Sessions, they made that a priority. And so now what we are seeing upstate especially on these raids on the dairy farms and such—I can only speak for New York, but I’m sure this is happening everywhere else—is that they are detaining these individuals, but then instead of using up one of their bed spaces, they are putting them into—they are putting them into marshal’s custody and other local prisons, and putting them through their criminal system. And they are looking for more ways. Every time we meet with ICE they tell us that they need our help—that if we don’t like the fact that they are sending people away that they need our help in advocating to reopen Rikers Island to ICE, and for any of you who are local advocates—(laughs)—you know how horrifying that suggestion is, so—but they say it with a straight face. They’re like why don’t you help us reopen Rikers, and I’m like, sure—(laughs)—you know, and then we can all go to a baseball game because that’s the kind of like fantasy world we’re suddenly living in, so yeah. PRESTON: Somewhere here—you there, yeah. Sorry. GAJAWEERA: I’m Nalika Gajaweera. I work at USC Center for Religion and Civic Culture. One of the many things that we are doing is we work with the Hilton Foundation’s Catholic Sisters Initiative. We are the MEL partners for them. And so my question is kind of framed from that work we do. What role do you see women religious figures playing in the issues that we’re talking about in terms of immigration? I know you mentioned that women and children are one of the larger—compose a lot of the immigrants and refugees coming to the country right now, and so do you see—I mean, different figures in the religious community, in the faith-based communities play different roles. Is there anything—and we’re trying to understand what do women religious leaders—what role might they specifically play within the larger faith-based efforts? If you can speak to that—I’m not sure—it’s a very specific question, but, yeah. MACKLER: I think they can take on all roles. I don’t think that there is a gender divide there as to who, you know—but you mentioned family detention, and it actually kind goes back to your question in light of the detention. They regroup. In my experience immigrants, when in detention, fall back on their faith. Even those who may have strayed at some point fall back on their faith as a guiding strength to get them through what is an absolute ordeal. PRESTON: Yes, here. Uh-huh, there, and then I’ll go back over there. MOORE: Thank you. Diane Moore, Harvard Divinity School. So this is a great conversation, and I really appreciate it. I want to circle back. Alex, you made a comment early making a claim that faith communities are pretty united or are united on the value question, and I think I want to revisit that because clearly we know that there are many evangelical Christians particularly who are supporting President Trump and have supported his policies, so I think there’s actually a lot more internal diversity regarding these questions, and I’d love to hear the panel speak about that. ALEINIKOFF: Well, I think I was referring to—I think Julia mentioned just the biblical injunction to be kind to strangers seems to be—we looked at this actually when I was at UNHCR. Antonio Guterres, she was then the high commissioner of refugees, now the secretary-general—had a very large convocation of religious groups from around the world in refugees, and we found that in virtually every faith-based—every group that we brought in there were statements in their tradition about caring for refugees. So at some level I think—now whether you are talking about particular policies, I guess we’re all—we’re divided in this country in many ways, but that’s, you know—it would be hard to find in religious doctrine, you know, particular points on DACA, it seems to me, right? I mean, it’s not—it’s just not going to get to that level. I’m at a more general level, but I’m happy to be corrected on that as a matter of religious doctrine. PRESTON: I’m going to go back to the back there. Sorry. WALKER-SMITH: Good morning. I’m Angelique Walker-Smith from Bread for the World. I’m the senior associate for Pan-African and Orthodox Church Engagement. My question has two parts to it—or they are really two questions. I’m cheating a little, I’m sorry—but very quickly. The first one is I’m intrigued by the ways in which our executive branch is advancing what I would call inhospitable policies toward—the conversation we’re having—towards immigrants, migrants, et cetera, but also the counter-response of the courts and how they are playing a role relative to this debate. And I’d like to hear some of your comments about that and what do you foresee relative to the courts playing a role that help to balance, if you will—“balance,” quote, quote—(laughs)—the situation. My second point is heretofore I haven’t heard many comments about Africa, and South Sudan in particular, which we know is a hot spot just like Syria is, and I don’t hear enough conversation about that narrative. I’m also intrigued in that particular situation of Uganda that is receiving refugees out of South Sudan and actually giving land for people to live on once they get there, that they have a policy that I think is one of the more hospitable policies relative to receiving South Sudanese and others in that area. Of course there are also the neighboring countries that are also receiving South Sudanese, and of course, that’s not the only context. We know Central Africa also has issues. But that’s also related to my question around the Mediterranean Sea and the thousands of folks coming from the continent, going up to Europe where of course we know there are inhospitable policies relative to their arrivals. So I’d like to hear some comments relative to Africa and the comments I’ve made, and then the courts. Thanks. MACKLER: I’ll take the courts. Thank God for the courts—(laughs). They have—I feel like we’ve been going through—I don’t know—I’ve been very tempted to send Marbury v. Madison to the president a few times over the course of the last 15 months, and for those of you aren’t law geeks like me, Marbury v. Madison was the case decided by the Supreme Court that established the judiciary as a third and equal branch of government. And it has been our stop gap, you know, and it has been amazing to watch how consistently they’ve pushed back. One thing that—about the courts is that they’ve never taken kindly—it doesn’t matter who appointed the judges, the justices—they’ve never taken kindly to being stripped of their power to review decisions. We saw this very clearly in the aftermath of 1996 and those immigration reform laws where they tried to strip jurisdiction out of courts, and the courts pushed back hard. I think we’re seeing that now, and it’s interesting. I feel like every funder who I talked to these days for immigration-related issues wants to hear about impact litigation. Are we doing impact litigation? Are we going to bring cases? And we’re trying, and at the same time it’s sort of like do we want to? I mean, are we really going to reshape jurisprudence to this level? But the courts have been our last sort of place of—I’m not going to say hope; I guess I’ll say sanity. And I—you know, from a very personal experience I can tell you I was at JFK for ten days after the travel ban. I was coordinating the legal effort there, and when I heard that Washington court— district court decision finally putting an injunction and finally putting an end to it, I didn’t see that coming. I didn’t think—when I drove out to JFK that first Saturday morning, I didn’t think we were going to win anything. I never thought we’d push back. I never thought Hameed Darweesh would walk out of that terminal just a few hours later. I never—I don’t—I didn’t believe it. At that point I was so demoralized, and I know—and I’m speaking for myself, but I know most people, though, who were with me thought that same thing. That Ninth Circuit Court decision was the best thing I’ve read all year on both, you know—just the language that it used. And I think the courts are creating a historical record for us, as well. You know, there was an amazing decision by the Eastern District of New York that put the stop to—a local activist from the New Sanctuary Coalition, Ravi Ragbir, that said we are not a country that snatches people off the streets. And it wasn’t until that moment that I was like, oh my God, we are becoming a country that snatches people off the streets. So they are creating a historical record. ALEINIKOFF: Just a quick word on Africa. I think you are really right to call attention to Africa. The—80 to 85 percent of all refugees are taken care of in the global south. We focus on those who try to—try to get to Europe, but the vast—the actual—the real significant problem—most significant problem for refugees is they get stuck in these countries of first asylum and can’t go home, and can’t move beyond. But the burden is borne by the developing countries, and so the global compact on refugees is actually written with a—very much with an eye to sharing that burden more globally in some way around the world. Uganda is a particularly important case. They really do have some of the most progressive policies on migrants. They don’t put refugees—they don’t put refugees in camps. They allow refugees to work, and to start businesses. They have been good partners on helping, as you said, South Sudanese, but also refugees from other countries, as well. Ethiopia has taken in millions of refugees, as well, so there’s—and Africa actually has been leading in terms of the African—the OAU Convention on Refugees has a broader definition, as I mentioned. There is now negotiations underway in the African Union to create free movement within the continent. There’s a lot happening in Africa—a lot that Europe can learn from how Africa has handled these problems. O'NEIL: Let me just add one thing there. Actually, some of the Latin American nations have been sending officials to Uganda and Turkey for best practices on how to deal with the Venezuelans migrants, and one of the things that I’m not sure came directly out of that, but I think it probably helped inform the decision, is Brazil had actually—the military has been flying Venezuelan refugees away from the border to other parts of Brazil to try to give them the space to integrate and a larger economy in which to sort of form a new life. So I think those are examples that are being replicated in this hemisphere. PRESTON: So we have about five minutes left. In the back there. DAULT: Sure. I’m David Dault. I’m the host of the Things Not Seen radio program based out of Chicago. First of all, I just want to thank the panel. This has been a really enlivening and enlightening discussion. So we have seen that the courts have also been a place where ICE has targeted refugees and immigrants. When they go into the courts for recourse, sometimes ICE is waiting or ICE will take them directly out of the courtroom. You also mentioned Ravi Ragbir. NPR and other news outlets over the last six weeks or so have been reporting that ICE has been targeting specifically leaders—and I know that Ravi Ragbir was apprehended at one point—and so specifically targeting leaders for a sort of chill affect scare tactic. So my first question is this reporting that says that this has increased under the Trump administration and under ICE, is it accurate to say that or has this kind of targeting of leaders always been happening under the Obama administration and previous administrations. PRESTON: Maybe that we could—you could just do that one question? DAULT: Sure, yeah, and so that’s—that would be my main question, and I appreciate it very much. MACKLER: Yeah, I think it’s absolutely true. We’ve seen it not just in the targeting of leaders, but they’re—what’s the word?—they’re specific in who they go out—they are looking, they are targeting individuals who are going to send a message, and so leaders like Ravi are definitely—you know, and there’s been others, some DREAMers and such are—it’s a message that they are trying to send—I mean, targeting New York City, you know, because of their, quote, unquote, “sanctuary” policies is another strategy. And also we’ve seen it in—not necessarily leaders, but somebody, an immigrant who spoke up at a press conference to tell their story and then getting arrested. So I—the short answer is yes. ALEINIKOFF: The other big change under this administration is they removed all these policies that had prioritized enforcement and so now basically everybody is fair game. BADER-SAYE: Thank you. Scott Bader-Saye, Seminary of the Southwest, Austin, Texas. As an ethics professor, I spend a lot of time getting my students to figure out how to talk to people they disagree with, and one of the recent—fairly recent sources that I’ve been using is the work of Jonathan Haidt, here at NYU, a moral psychologist. And one of the things Haidt talks about is the ways that we talk past each other because we appeal to different moral foundations, and that folks on the left tend to appeal to a care/harm foundation. And part of how we get into conversational bubbles is that we all appeal to the same foundation. So we have a group here that’s probably very much tuned into a care/harm foundation. And the people who are on the opposite side of an issue like this tend to appeal to other foundations like Haidt’s authority/subversion foundation. And for them authority and subversion is a crucial issue, and so for them it’s—a question like immigration is all about how do we enforce proper authority. If we’re going to have a conversation that breaks out of our own bubble, are there ways that we can speak to people for whom that’s their major moral foundation in a way that might be persuasive to them? MACKLER: That’s a great question, and it’s actually—you phrased very eloquently something I’ve been very much struggling with. I think it has been interesting to hear this conversation this morning because, personally, I have moved away from that moral—this isn’t our values, this isn’t who we are kind of argument, not because I don’t believe in them—I a hundred percent do—but because it’s a matter of self-preservation, like, I can’t be with—you know, see these families day after day after being destroyed and thinking this isn’t who we are. So to me, I’ve moved it to a systems conversation and it’s easier for me to do because, again—I mean, I’ve said this a million times—I’m a lawyer, and so I’m—the destruction of the systems is galling to me, right? It’s like how do we have a system that—you need a justice system that is just, that is fair, and that is not what is—and it not, frankly, what was happening five years ago either. But it is just breaking down even more, and Jeff Session is just breaking down—I mean, a court of law should be a court of law where law prevails, and that’s not what’s happening right now. And that’s happening at every level. So that’s how I do it. And it’s interesting because some of the people I have the best conversations around this with are actually, you know, the head of Customs and Border Protection—(laughs)—at JFK Airport, like people who definitely don’t agree with me and my point of view, right, but those are the most fruitful conversations that I have had. ALEINIKOFF: So I’m not sure we’re going to come to agreement on these issues, but we did come very close to comprehensive immigration reform where people could support legislation even if they had different views. So it was a little bit more enforcement, a little bit of legalization, so you could put together a package that would be good enough for a lot of people in the middle. But ultimately, you know, there is some right and wrong. I don’t think we all have to agree on this stuff. And what I’m—I mean, my message here is keep the faith in the following sense. I do have strong views on these issues, and there is—really none of this administration’s policies command a majority of support in the American people. We forget that—the wall, DACA, cuts in refugees, the Muslim ban, and cuts in legal immigration—those all polled negatively for the president. And sometimes democracy wins and people can say we don’t like that policy. We don’t have to agree on these issues. We win and we vote on these issues, and I think the majority of Americans are in favor of a fair and decent immigration policy, and this becomes a political issue, not just an ethical issue. PRESTON: All right. Thank you.